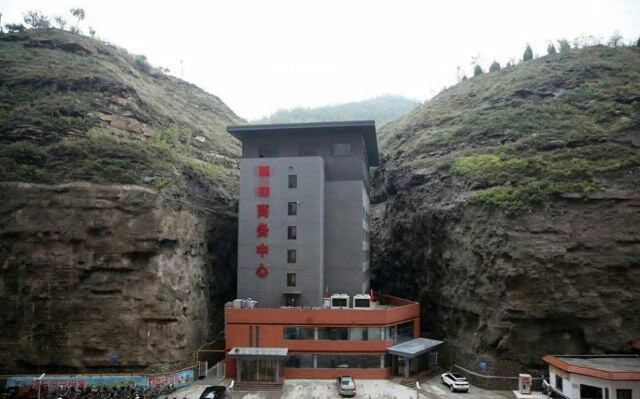 2 Photos showing an eight-story business hotel, in Yanchuan county in eastern Shaanxi, have gone viral on the Chinese internet squeezed inside a ridge. 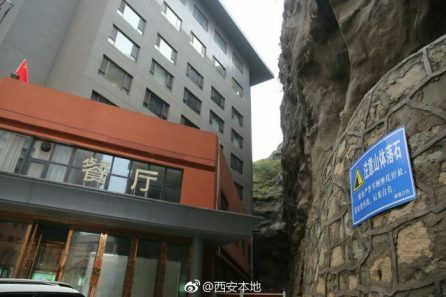 Photos showing an eight-story business hotel, in Yanchuan county in eastern Shaanxi, have gone viral on the Chinese internet squeezed inside a ridge. With the hilly area lacking in suitable land, local officials gave their permission to build the hotel in such tight space. The staff reassured reporters that the building was perfectly safe, though admitted that they had to warn guests to watch out for small rocks falling on their heads. Netizens joked that the building was built “rou jia mo” style, the famous Chinese street-snack. The hotel in Yanchuan county in eastern Shaanxi.